We offer Standard Shipping, Express Shipping and COOLSHIP to the following service areas: United States, United States Minor Outlying Islands and Puerto Rico. We offer a 30 day no hassle return policy on non-perishable items. We accept all VISA, MasterCard, American Express and Discover credit cards. All orders shipped to AR, CA, CT, GA, IL, IN, NJ, NY, OR and TN addresses are subject to sales tax. Harry Burnett "H. B." Reese (May 24, 1879 — May 16, 1956) was an American inventor known for creating REESE'S Peanut Butter Cups and founding the H. B. Reese Candy Company. He was born in York County, Pennsylvania on an agricultural and dairy farm. He married Blanche Edna (Hyson) Reese on August 1, 1900. By 1928, H. B. and Blanche had sixteen good reasons (children) to invent the Reese's Peanut Butter Cups. He first moved to Hershey, Pennsylvania in 1917, where he enjoyed a relatively prosperous job on a dairy farm owned by The Hershey Company until the farm was closed by Hershey's. Not long after moving his family to Spring Grove, Pennsylvania, Reese moved back to Hershey, again working for Hershey's. 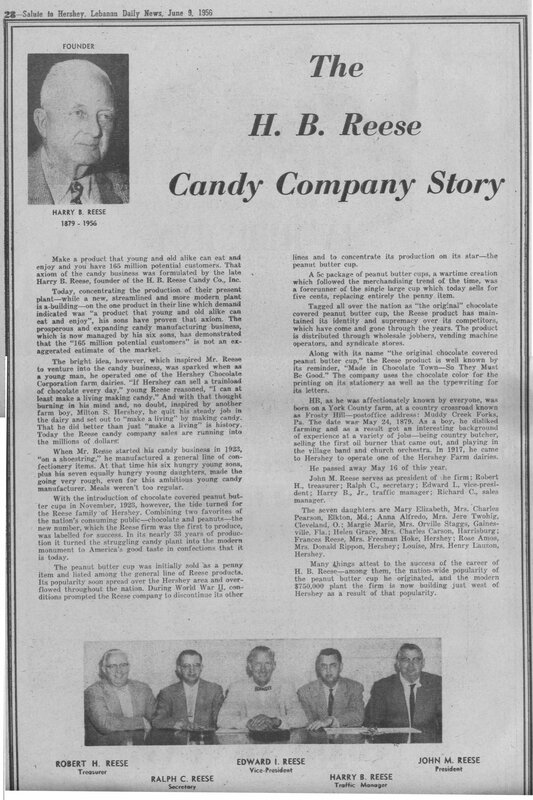 Always an entrepreneur and inspired by his work, Reese began experimenting with candies in his basement, by 1923 he created the H. B. Reese Candy Company. He built a new home and factory for his growing business in 1926, selling a large assortment of candies. 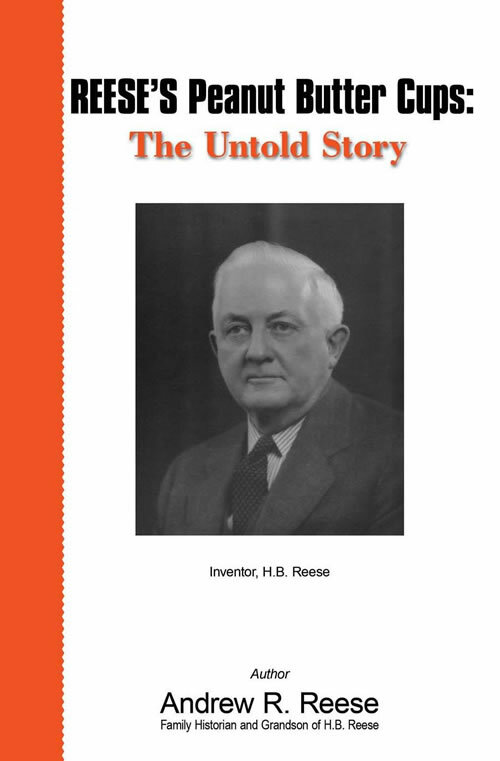 Then in 1928, H. B. Reese invented the Reese's Peanut Butter Cups. H.B. Reese initially sold his many candies on consignment to retail stores, but by 1935 he was a success and was able to burn all his mortgages. During World War II, economic constraints and scarcity of materials led him to discontinue his other candies and concentrate solely on his peanut butter cups, his most popular offering. A bright look highlights a distinctive taste. With this cap, your style and candy choices will surely turn heads. The solid orange color stands out no matter where you are, while the comfortable fit will make this your favorite. A six-panel snapback in cotton features a pre-curved bill, a belt loop adjustment, and embroidered logo patches on the front and back. It's a widely known fact: Dogs love squeaky toys. And when you give your dog the REESE'S Peanut Butter Cup Dog Toy, we're pretty sure Fido will probably never get over the sheer joy. The REESE'S Peanut Butter Cup Dog Toy is an orange, bone-shaped dog toy with an enticing squeaker inside and knotted rope at both ends — perfect for playing tug-of-war games with your pooch. Toy features the REESE'S logo embroidered in yellow and brown on the front. This clever tee is enough to make anyone smile. "Chocolate and peanut butter walk into a bar. The rest is history." Fun, bright-orange REESE'S Peanut Butter Cup shirt is sure to garner chuckles from even the most stoic of shirt readers. Made of super-comfortable 100% preshrunk cotton, this shirt is destined to become your new favorite. Chocolate and Peanut Butter 13oz. Give your snack a new flavor dimension with REESE'S Spreads with Chocolate and Peanut Butter. Dip in a pretzel, cookie, apple, or celery stick for a sweet addition, or spread it onto bagels, croissants, or waffles as a tasty way to start your day. And for baking, its smooth, rich, unmistakably creamy milk chocolate and REESE'S peanut butter taste elevates any dessert. However you choose to use it, this 13-oz. jar will go fast! The REESE'S Mini Peanut Butter Cups Bag is the ultimate combination of flavor and ease. No wrappers to undo; just open the bag and pop one of these perfectly shaped mini REESE'S Peanut Butter Cups into your mouth. It's got all the rich taste of a full-size REESE'S Peanut Butter Cup — in an extraordinarily tiny size. Each bag contains a full 8 ounces of pure peanut butter and chocolate scrumptiousness! Support Team USA and enjoy Olympics REESE's Peanut Butter Cup Miniatures. These delicious REESE'S treats come individually wrapped in Olympic packaging. There's no sweeter way to cheer on TEAM USA. REESE'S Peanut Butter Cups have a taste so simple and clear that it's beyond delicious. And this adult shirt goes just as far with a straightforward design that makes a big impact. A 100% cotton short-sleeve tee jumps out with its radiant orange hue — in a crowd of blues, browns, and grays, all eyes will be on you. In that second glance, they'll also note your treat of choice — that perfect and timeless combination of peanut butter and chocolate. When you have a two-pack or a sack of REESE'S Peanut Butter Cup Miniatures , you don't have to try hard to stand out. This shirt has a similar effect. A 100% cotton short-sleeve style in orange makes a splash, especially when you're standing next to everyone clad in dark, neutral colors. But the shade doesn't just make you a hit — the front, silkscreened with the REESE'S Peanut Butter Cup logo, warrants a second glance. For you, everything has to be about REESE'S Peanut Butter Cups — even what the baby wears! This shirt, made out of 100% cotton, matches your tastes precisely with its solid orange color and silkscreened REESE'S Peanut Butter Cups logo on the front, while the round neck and loose fit will keep your child comfortable throughout the day. Satisfy your peanut-butter passion with this case of 36 two-packs incredibly delicious REESE'S Peanut Butter Cups! There are three dozen 1.5-oz. packs of rich, delectable REESE'S Peanut Butter Cups drenched in smooth HERSHEY'S chocolate! That's nearly three and a half pounds of total peanut butter and chocolate bliss! We know it's always nice to share, but we won't tell anybody if you just tuck them quietly into a drawer to keep all to yourself. When you want a glorious peanut experience, you reach for a REESE'S NUTRAGEOUS Bar! It's a pure REESE'S peanut butter center, dipped in caramel, rolled in peanut crunchies and drenched in pure HERSHEY'S milk chocolate. And when you want to repeat that giddy peanut-butter and caramel experience again and again, you grab the 18-bar box of REESE'S NUTRAGEOUS Bars. Each box contains 18 full-size 1.8-oz. bars of crunchy-chewy, caramel-y, peanut-buttery deliciousness. Tantalize and satisfy your taste buds with this delicious and eye-popping combination that lets you have a REESE'S Peanut Butter Cup now and a hot beverage later. A rounded ceramic mug displays your favorite candy with a REESE'S Peanut Butter Cups logo on the front and text reading "Chocolate and peanut butter walk into a bar. The rest is history" on the back. Inside, you'll find an exceptionally delectable treat — an 11.1 oz. clear bag of REESE'S Peanut Butter Cup Miniatures tied together with a ribbon. Savor the sweet and salty taste, and then, once you're all out, fill the mug with a coffee, tea, or another hot beverage. Never again settle for an ordinary bowl of ice cream! Not when you've got the REESE'S Ice Cream Bowl! This fabulous ceramic bowl was absolutely made for ice cream, toppings and whipped cream! Bright orange bowl with familiar yellow REESE'S logo has comfortably sloped sides that make it easy to hold... and once you finish eating your sundae, there's another surprise waiting for you inside: an image of a REESE'S Peanut Butter Cup peeking up from the bottom of the bowl. The REESE'S Ice Cream Bowl is dishwasher and microwave safe. Just when you thought REESE'S Peanut Butter Cups couldn't get any more delicious... think again. We took the smooth, creamy texture of REESE'S peanut butter and enrobed it in HERSHEY'S white candy confection to make REESE'S White Peanut Butter Cups. It's a whole new spin on the classic REESE'S Peanut Butter Cup treat. And now you can get these taste sensations in boxes of 24. You get two dozen 1.5-oz. two-packs (that's two and a quarter pounds) of utter deliciousness to share with family, friends or co-workers. New in town? Break out a box and get in good with the neighbors. Order Now: REESE'S White Peanut Butter Cups — they're a smile waiting to happen. To the beach, down the street to the store, or even on a leisurely stroll, a quality pair of flip flops takes you pretty much anywhere in comfort. But while you feel freedom away from the confinement of shoes, why not have a look that matches your personal tastes? This pair offers just that. A thick-soled design, made out of 70% polyethylene and 30% PVC, has you ready for anything with textured bottoms and a Y-shaped rubber thong. The best part, though, is the REESE'S Peanut Butter Cups logo pattern covering both soles. You'll stand out in style wherever you go. A perfect pair? Two of a kind? Peanut butter and chocolate naturally blend together to create that salty, sweet, and creamy combination, and with this hat and T-shirt set, your personal look will be just as coordinated! A 100% cotton T-shirt lets you stand out in a crowd with its bright orange color and silkscreened REESE'S Peanut Butter Cups logo on the front. Complimenting that, the six-panel snapback cap in dark brown effortlessly fits and matches with an oval logo embroidered on the front. Shirt comes in a short-sleeve, crewneck style with a loose fit, while the 100% cotton cap features a pre-curved bill and a belt adjustment. The hat is one size fits all. Proclaim your fondness for your favorite REESE'S product with this cozy sweatshirt! Bright-orange hooded REESE'S sweatshirt not only keeps you warm, it'll help you stand out in a crowd! Comfy heavyweight cotton-blend sweatshirt has a slant-open patch pocket in front and ribbed cuffs and waist; hood features metal grommets and matching knotted-end drawstring cord. REESE'S Peanut Butter Cups felt logo is appliqued across the front. Layer up with this REESE'S Peanut Butter Cup-themed sweatshirt. Fall's right around the corner, so what better way to keep the cold out than with a soft, insulated garment? Stretch cuffs and a fitted waistband provide a close fit, while the front pocket presents a quick and easy way for keeping hands warm. Beyond the practical, an orange shade pops amongst the other gray and black pullovers. A sewn and embroidered classic logo is designed to last through daily usage and multiple washes without fading. The REESE'S brand orange latte mug features the unmistakable yellow REESE'S logo and comes filled with 6½ ounces of REESE'S Peanut Butter Cup Miniatures, tied with an enticing orange REESE'S-print bow. And once all the peanut butter cups are finished, you can enjoy the rich, creamy goodness of your favorite latte (or even HERSHEY'S hot cocoa) again and again. Filled mug makes a great gift for the chocolate and latte lover in your life. Two gigunda REESE'S Peanut Butter Cups in one enormous package! These One-pound REESE'S Peanut Butter Cups will delight the most serious peanut butter lover. We recommend you find a friend or two or three (or seven) to enjoy these with. Makes a great gift for your favorite peanut butter (and chocolate) lover. You don't have to take a suitcase to HERSHEY'S CHOCOLATE WORLD Attraction, but you can find one filled with your favorite delectable treats. All essentials are packed in a clear box to go on the road: REESE'S Peanut Butter Cups, KIT KAT Wafer Bars, a HERSHEY'S Milk Chocolate Bar, a YORK Peppermint Pattie, and a TAKE 5 Candy Bar. Now, for any instance that may arise, you've got a delicious taste to savor for the occasion. A sweet interpretation of a classic comfort food! The snack you loved as a kid is now a great snack for adults. Covered in HERSHEY'S Milk Chocolate, each graham cracker is sprinkled with REESE'S peanut butter chips for an extra dimension of crunch and taste, and then packaged in this attractive clear container. For a mouth-watering, nostalgic treat, this 8-oz. blend of flavors hits the spot. It's the perfect gift for the football lover in your life. A collectible REESE'S Mini Football! Measuring approximately 8" long and 4½" in diameter, this miniature REESE'S-orange and yellow football with authentic REESE'S logos is great for tossing around in the yard with friends or siblings. It even looks great as part of your football-themed (or REESE'S-themed) collection. Satisfy your darker side with these delightfully delectable REESE'S Dark Peanut Butter Cups! You get two dozen 1.5-oz. two packs of rich, incredibly delicious REESE'S Peanut Butter Cups drenched in deep dark chocolate! That translates to a full 2¼ pounds of total peanut butter and dark-chocolate blissfulness! Hey, it's nice to share, but we won't tell if you just tuck them quietly into a drawer to keep all to yourself. REESE'S Peanut Butter Cup Miniatures - 25 lb. Case. And this case of delectable goodies is perfect for monster-scale celebrations, trade-show booth freebies, making up your own party or wedding favors... or anything else you can think of. Each case contains a full 25 pounds of REESE'S Peanut Butter Cup Miniatures. A gift picked out with someone's taste buds in mind shows you care. And for that special someone who salivates over peanut butter and chocolate, this package sends the right message. The flavor (and heart) is in the right place with nine treats combining the creaminess of chocolate with peanut butter's salty goodness. Covering classic to modern favorites, this collection is a must for the REESE'S Peanut Butter Cup Lover in your life. Enjoy your favorite treat — without all the sugar. With only 37 calories per piece, these Sugar Free REESE'S Miniature Peanut Butter Cups have all the smooth, delicious taste of regular REESE'S Miniature Peanut Butter Cups — with none of the sugar and not a trace of guilt! Each bag of Sugar Free REESE'S Miniature Peanut Butter Cups contains 3 full ounces of pure deliciousness. REESE'S Creamy Peanut Butter really packs a powerful peanut punch! It's so smooth, delicious and dreamy, it'll perk up your ho-hum lunch and make your sandwiches sing! Ideal on crackers (or smeared on a HERSHEY'S Milk Chocolate Bar), it's the perfect high-energy snack when you need an extra protein boost to get you through the afternoon doldrums. Kit of two big 18-oz. jars contains 32 servings — more than enough for a full week of lunches for the entire family! Big 18-oz. jar contains 16 servings... just think of the perfectly peanutty possibilities! Craving a light, crunchy snack that packs a serious peanut-butter punch? Each stick features three layers of crispy, crunchy wafer bars sandwiched with delicious peanut butter and then drenched in rich, dreamy HERSHEY'S milk chocolate. Each 1.5-oz. pack contains two tasty crisp-wafer treats. And now you can stock up on the chocolate and peanut-buttery goodness with a 20-count box of REESE'S Sticks. Box contains nearly three and a half pounds of pure REESE'S goodness.